28 Jan 2019 --- A dairy-enhanced Mediterranean diet will significantly increase health outcomes for those at risk of cardiovascular disease, even proving more effective than a low-fat diet, a study has found. The University of South Australia findings deliver healthier options for Australians by tailoring the nutrients in the Mediterranean diet to meet the needs of a non-Mediterranean population, say the researchers. Published by the American Journal of Clinical Nutrition, the researchers compared the health benefits of a Mediterranean diet supplemented with two to three serves of dairy each day and a generic low-fat diet. The results show that the dairy-supplemented Mediterranean diet (MedDairy) significantly improved blood pressure, heart rate, cholesterol, mood and cognitive function. The new MedDairy diet challenges popular perceptions of what is considered healthy, according to Ph.D. candidate, Alexandra Wade. 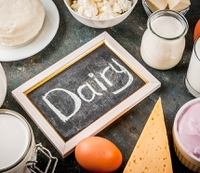 This study shows that the new MedDairy works better than a generic low-fat diet, ensuring better health outcomes for people at risk of cardiovascular disease, the paper concludes. The MedDairy diet also meets additional calcium requirements recommended by Australia's national health bodies. A typical Mediterranean diet includes extra virgin olive oil, fruits, vegetables, nuts, seeds, legumes, whole grain breads, pastas and cereals, moderate consumption of fish and red wine, and low consumption of red meat, sweet and processed foods. It also includes 1-2 servings of dairy foods (700-820mg calcium), which is less than half the dairy recommended by the Australian National Health and Medical Research Council (NHMRC) for older Australians. In Australia, women up to age 50 years – and men up to age 70 years – should consume 1000mg per day of calcium per day and 1300mg thereafter, which is about 3.5 and 4.5 servings a day. The new MedDairy diet allows for three to four servings with dairy, which means Australians can more sustainably meet their recommended daily nutrient intakes while also maintaining the significant health benefits offered through the MedDiet, the study notes. “When it comes down to it, people want to be able to enjoy a colorful, tasty and nutritious diet. And if you're one of the thousands of people seeking to improve your cardiovascular and cognitive health - look no further than the MedDairy diet,” Wade concludes. A host of studies have expanded the health halo of the Mediterranean diet. An Italian study identified that senior peoples, aged 65 years and older, who adhere closely to the Mediterranean diet have a 25 percent lower risk of any cause of death. Meanwhile, sticking to a Mediterranean diet that is rich in fruit, vegetables, nuts, unrefined cereals, olive oil and fish can reduce hip bone loss within just 12 months, according to research from the University of East Anglia.